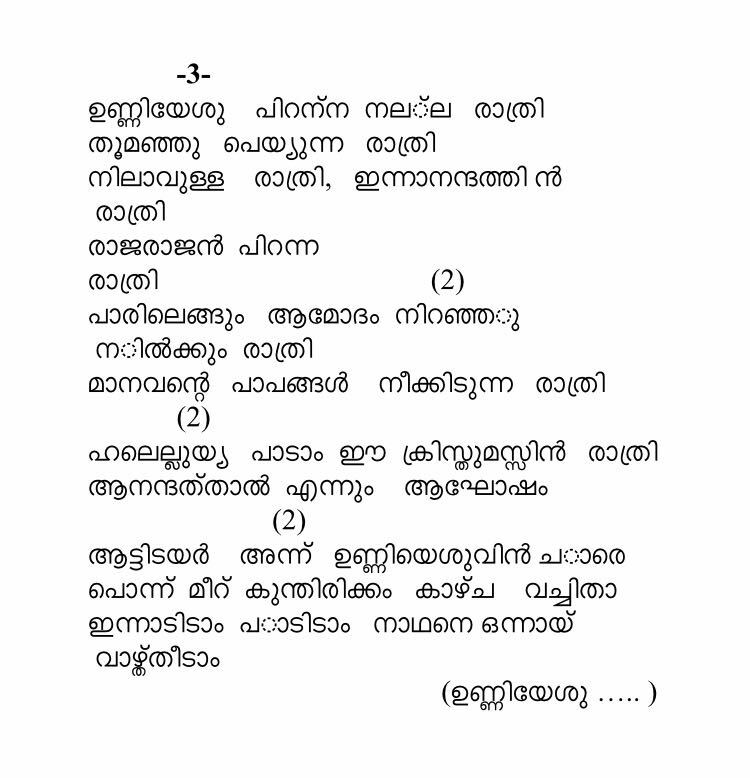 Music and lyrics of the most popular Malayalam and English Christmas carols songs. Christmas carols are based on Christian lyrics and relate to the Nativity. Click on each Song title bar to expand and view the Song Lyrics and Audio player to sing along and learn the song. Scroll down to view the list of songs. Merry Christmas and enjoy singing the wonderful words and lyrics of the Christmas carols songs featured on this website. Aanandhageethangal yeshuvin naamathil Paadeedaam ee sudhine…..
Jaya jaya geetham jaya jaya geetham Paadeedaam ee sudhine…..
Shaantha raatri thiru raatri ..
Doore ninnum dooore..dooore..ninnum marubhoovin vazhikaliloode..
Oru pulkkudil thedi..deva suthane thedi..idayanmaarumanjallo..
Nava swara manjariyil oru manassode..naadhane vazhthi paadunnu..